Social media can be a really great thing. It can allow us to connect with friends and family easily no matter where we live. It can help us share the funny stories of our little ones with the masses. It can allow us to ask questions and get advice from other moms on questions we have on motherhood. Yes, when used correctly, social media truly is a wonderful thing. But it can also lead to a lot of discontentment. Perhaps you're have financial hardships and your newsfeed is filled with photos of fancy dinners and vacations your friends are taking. Perhaps you're struggling with infertility and your newsfeed is filled with pregnancy and new baby announcements. Perhaps your child is struggling in school and your newsfeed is filled with honor roll report cards. Perhaps you're stuck renting a house you hate and your newsfeed is filled with brand new homes. Or perhaps its not even that serious. You are bombarded with fancy craft projects when you can barely color inside the lines. You see endless pictures of fancy Pinterest worthy treats and you burn toast. You see stylish moms with young kids AND perfectly put together wardrobes and you can barely manage to squeeze a shower in once a week. You see all these elaborate, well thought out Elf on the Shelf setups and you're lucky if you remember to move him to another shelf. The list goes on and on. Of course, we know that social media is not always the most accurate portrayal of someone's real life. We know that we see only the best of people- the things that they are choosing to let us see... but even knowing so, it's still hard not to compare ourselves to other. We all want those Pinterest worthy meals and crafts and homes. It's hard to be content in a world where comparison is the norm. It's easy to get caught in the comparison games we play with our appearances, our kids, and our homes. Kay reminds exhausted families about tried and true remedies from the pressures of competitive living. 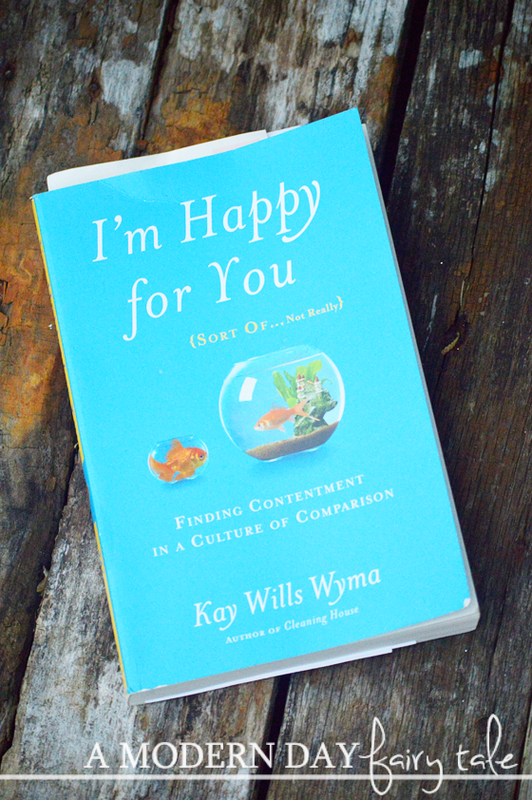 With candor and humor, I'm Happy For You (Sort Of...Not Really) explores the troubling effects of living in an excessively competitive culture and reveals simple yet effective ways to escape the comparison trap. Join Kay and her family as she's started to #HydrateForTheHolidays on her blog posts to learn how to recapture contentment and joy, especially in Nov. & Dec.!! She'll be sharing thoughts throughout the season! This is one book that I think we could all benefit from! I tend to think that I'm a fairly content person... but even I have those moments where while I am happy for someone for the good things that come to them, it's hard not to be envious on occasion. We're only human. This is a quick read, but well written and gives a lot of food for thought. I particularly love the 'You're Not Alone' sections which feature stories from other real life women so that we truly can see that we are not alone in this feeling of not living up to our own impossible expectations. It's also a fantastic book to read with your book club or mom's group and even offers discussion questions to help! With the new year approaching, there is no better time to take a look at our attitudes and try to live a more content life...and for that, this book is a must read! Omgosh isn't this the truth!! I like to remind myself that we only see a very very small portion of anyone's life on social media ;) And in normal interaction!! Hereit is you've a executed a exceptional job right here to share that article with us. You have got located it after some study and therefore certainly in any respect that it's going to support us all. I am here to seem for some information with regard to one among my OOH media software . I'm hoping it helps me to get influenced and observed an answer for my drawback quickly.